PILED AND DEEP WATER SINKER MOORINGS AVAILABLE! Established in 1959 we are close to the entrance of Portsmouth harbour. You will find us adjacent to Royal Clarence Marina and Burrow Island, Forton lake extends beyond the millennium lifting bridge and our moorings shelter behind the sand bar and extend up the creek. We have a varied mix of Sailing yachts and Motor boats up to 30ft in length, We enjoy social functions in our modern clubhouse or barbecues in the yard with a newly refurbished pontoon and storage racks for tenders. Come and join us or contact us if you would like more information! From this year 2019 the QHM Portsmouth have decided all boats moored in the harbour need to be licensed. This is so QHM can identify boats that have broken adrift or boats that have been dumped. QHM know what batch of numbered stickers have been allocated to the GCC. I now have to issue these to all boats moored in our jurisdiction and note what number goes with which boat and these have all got to be in place by the end of May this year. As regular users of the harbour it worth an early season reminder, that with the arrival Queen Elizabeth Class Carrier, that the General Direction in relation to the use of the Small Boat Channel was updated in last Autumn. 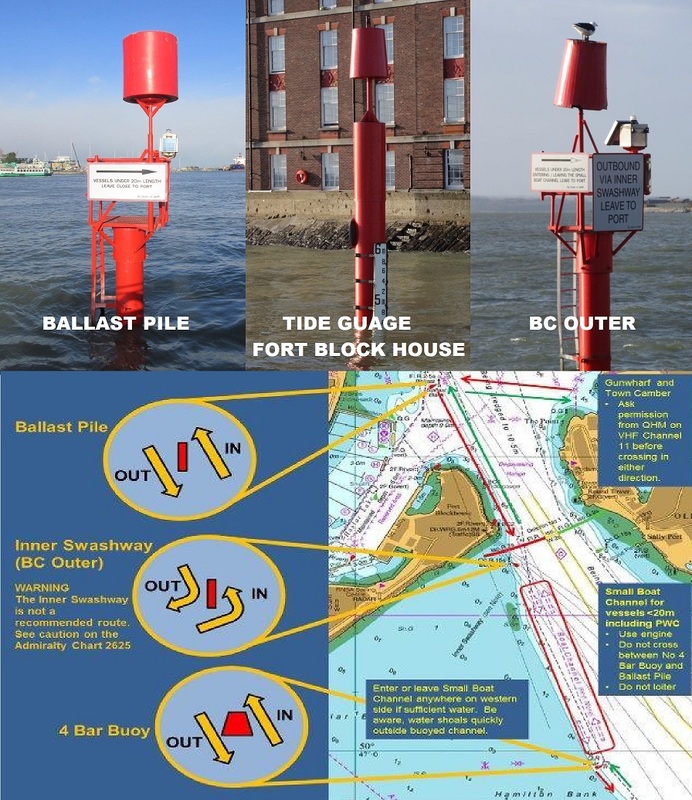 The Portsmouth Harbour entrance and main approach channel is considered a narrow channel in accordance with the International Regulations for Preventing Collisions and Sea (COLREGS) and as such, all mariners are reminded that in accordance with Rule 9(b) "a vessel of less than 20 metres in length or a sailing vessel shall not impede the passage of a vessel that can safely navigate only within a narrow channel or fairway". This image is listed in the General Direction but advises some of the key points of the Small Boat Channel. Thank you and safe boating. Port Safety Officer Assistant, QHM Portsmouth, Room 404A, Semaphore Tower, HM Naval Base, Portsmouth, Hampshire, PO1 3LT.